a hired farm worker living in employer's house and liable to he called upon bo do any kind of work, in some cases, heavy domestic work; obsolescent. a casual worker who catches predatory birds, by netting or shooting. a casual worker employed in scaring birds, by shouting, or by using rattle or shot gun. Scottish term for woman brought by ploughman or hind (023) (q.v.) (generally wife, sister or daughter) to work on farm with him. Lincolnshire term for man employed in any low-grade work in agriculture; usually a casual worker; may also run an allotment or small holding. a farm labourer (q.v.) on farm employed on yearly or half-yearly agreement. a farm labourer (q.v.) who lives in a cottage belonging to the farm and does general work on farm. (ii) in South of Scotland, a ploughman (023), shepherd (020), cattleman (022) or woman worker on a farm who lives rent free in a cot house '' on the farm as part payment for services. Irish equivalent of cottar (q.v.). Scottish terms, see bird scarer. a casual worker, or odd man, engaged to assist some other worker and may undertake any work, e.g., piecework, haymaking, hoeing, hedge cutting; obsolescent. Lancashire, North of England and Somerset term ; a casual labourer who works by the day on any job performed by the ordinary farm labourer. is employed by the day, on casual farm work. digs out the channels of ditches or watercourses on a farm or landed estate; builds up the banks with the soil dug out; cuts thistles and clears weeds with sickle and rake; cf. drainage labourer (026). Lincolnshire term , a carter (023) (q.v.) engaged temporarily on driving seed drill across the fields and regulating supply of seed. farm servant (Scotland), field hand, general labourer (farm), husbandman; general term for any farm worker engaged regularly, as distinguished from a casual worker, to undertake any kind of manual labour on a farm, e.g., hoeing, haying, threshing, hedging and ditching; duties do not include care of animals. as for farm labourer; may also drive cattle or assist carter (023) (q.v.). (ii) in Scotland, see farm labourer. one of a gang of field hands (q.v.) or other workers, working under charge of gang master (015) (q.v.). cuts trusses of hay from hay stack with hay knife; lays trusses on table of baling machine; compresses hay by pulling on long lever; secures bale by tying twine or twisting wire ends; releases and lifts off bale; trims sides of bale with hay knife; resets twine or wire in machine for next compression; cf. hay baler attendant (021). a farm labourer (q v.) who together with hay cutter (q.v.) does work of hay baler (q.v.). cuts hay (or straw) from stack into trusses by hand, with a hay knife, in readiness for hay baler attendant (021) (q.v.). banks up earth with a spade to form hedge foundation; plants branches of hawthorn and other hedge plants; prunes hedge at appropriate seasons and repairs it by inserting bundles of cuttings from pruned hedge into gap; sometimes closes gaps in hedge with barbed wire or wood. combines the work of the hedger (q.v.) and ditcher (q.v. ); may also assist in estate work, including forestry. a farm labourer (q.v.) engaged on any work connected with a hop garden, e.g., hop planting, hop digging, dressing, washing, poling, stringing, priming, chopping, manuring, earthing, pole pulling, stripping, stacking poles, rolling bines, cutting off bines; sometimes also dries hops in oast house, spreading the hops on floor covered with horse hair, under which are stoves; after ten hours, takes hops off kiln, allows them to cool a little and packs into "pockets" ready for despatch. a casual worker who picks hop flowers into bins or baskets from bines brought by hop ground labourer (q.v.). a casual worker in a hop garden who ties the bines to poles or trains them along strings or wires. in some districts, see farm labourer. looks after watercourses, sluices, etc., and keeps clear of weeds; at proper seasons lets water into watercourses and floods meadows (called "floating"). 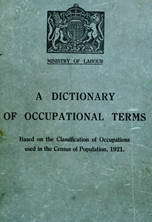 North of England term for unskilled labourer on farm. Lincolnshire, Kent, or Somerset term; as for farm labourer; employed on marsh land. a casual worker on farm. is not in permanent employment of a single farmer, hut undertakes work by contract. e.g., planting, weeding, hoeing. Scottish and North of England term ; a skilled handyman on a farm who does odd jobs not falling strictly within duties of shepherd, ploughman, etc. ; may do thatching, look after farm machinery; will take place of ploughman (023), cattleman (022), etc., (q.v.) who may he absent for any reason. a casual female worker on a farm, thinning turnips, planting potatoes, haymaking, etc. ; usually a relative of ploughman, living in immediate neighbourhood. a farm labourer (q.v.) who feeds pigs, with especial care in preparing food for young pigs; cleans out sty and lays down litter. a casual labourer who collects potatoes in sacks or baskets after they have been turned out of ground by potato raising machine and conveys them to "pit." separates "ware" (saleable) potatoes from seed potatoes, and from "chats" (small and poor potatoes, usually fed to pigs), on "riddle," i.e., a machine consisting of an inclined table perforated with holes of various sizes through which potatoes fall; turns wheel of machine which causes holes to open and close. (ii) a carter (023) (q.v.) who plants potatoes by means of a mechanical potato sower. a farm labourer (q.v.) who cuts seed potatoes with a knife into "sets," each having an eye attached capable of forming an independent plant. Cornish term ; a casual labourer employed for short periods on different farms; rarely works regularly on one farm. a farm labourer (q.v.) employed in digging, as contrasted with men who attend to cattle. Northumberland term ; a skilled worker, capable of thatching, looking after machinery, etc. Devonshire term for farm labourer (q.v.). a casual worker engaged in cleaning arable land by collecting stones which are used for road making. (in Berkshire and adjoining counties ) a casual labourer, employed to do odd work in fields or about the farm. constructs thick roof coverings for ricks or stacks; combs trusses of straw to make smooth and fastens combed straw securely to rick with straw rope; trims edges of straw with special knife; may also thatch cottages or other farm buildings; cf. thatcher (588). a casual labourer who hoes out, by hand, the weeds growing round crops in a field, working on a time or piecework basis. stretches wire from post to post in a hop field to form frame work upon which bines are trained; repairs broken wires or tightens slackened wires; work usually done by hop ground labourer (q.v. ).